First lady Michelle Obama delivers remarks while welcoming the Broadway cast of "Hamilton" to the White House March 14, 2016, including, from left to right: Lin-Manuel Miranda, Daveed Diggs, Christopher Jackson and Phillipa Soo,. Members of the cast were participating in a student workshop, student question and answer session and a performance of musical selections from the musical. 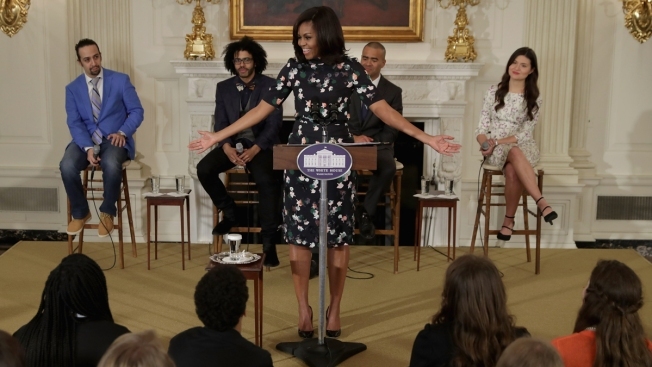 President Barack Obama and First Lady Michelle Obama welcomed playwright Lin-Manuel Miranda and the Broadway cast of “Hamilton” to the White House Monday for a workshop and special performance of selections from the sold-out musical. "It is an understatement to say this was one hot ticket," the president said, noting that the show "has become a favorite in the Obama household." After Obama introduced the performace, members of the cast performed a few of the show's numbers on a White House live stream -- opening number "Alexander Hamiton," a portion of "Aaron Burr, Sir" and the show's anthem "My Shot." You can watch the White House performance here. "We wanted to share this incredible musical with folks who otherwise might not get the experience," the president said, praising the show for its diversity in casting and storytelling. "['Hamilton'] reminds us that this nation was built by more than just a few great men, and is an inheritance that belongs to all of us." First lady Michelle Obama called the show "the best piece of art in any form that I have ever seen," stating that "to my mind, this is what school should be." "We hope this helps every teacher who spent hours trying to make 'The Federalist Papers' entertaining." the president joked. This wasn't the first time the president and first lady have seen “Hamilton.” The two have attended performances in the past -- most recently in November as part of a fundraiser for the Democratic Party. Miranda first performed material from the show’s opening number for the duo during a May 2009 event celebrating poetry and music at the White House. The book, music and lyrics come from Miranda, with direction from Thomas Kali (“In the Heights.”), who intrdocued the show's numbers during Monday's White House live-stream. “Hamilton” tells the story of Founding Father Alexander Hamilton, an orphan born in the West Indies who later moved to the 13 colonies. He went on to be a major figure in the Revolutionary War and served as secretary of the Treasury under President George Washington before he was killed in a duel.